-- Select a Size/Color -- 4 Mice - Out of Stock! 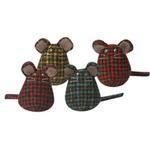 These plaid pals with have your cat chasing mice in style. Super cozy mice with long tails designed and sized just for cats. Each toy is stuffed with U.S. grown and certified organic catnip! 4 mice per set with 1 of each color: pink, yellow, red, and blue. 2.25" tall and 2" wide.